Oxford: Oxford University Press, second edition, 2012, cxx + 1124 pp, £225.00, hardback, ISBN 978-0-19-969293-4. Piracy and counterfeiting alone cost European businesses a staggering €250 billion in lost sales each year. The problem is aggravated by the rising volume of goods bought by European Union (EU) citizens online and shipped to them by post from countries outside the EU. The economic relevance of the phenomenon is hardly disputable. If one considers that the competitiveness of modern economies is increasingly based on creativity and innovation, it comes as no surprise that legislators, who are under the legitimate increasing pressure of intellectual property rights holders’ lobbies, look at the adoption of new and more effective measures to tackle these kinds of infringements. Such measures include border measures which are actions taken by the local customs authorities in relation to goods under their control, in particular, but not exclusively, at their exit from and entry to the internal market. In this regard, it should be borne in mind that the final destination of goods going through customs is not always the national-internal market. Although customs authorities do not establish the infringement of IPRs, it is commonly perceived that they are in a relatively good position to stop infringing goods before they enter the internal market, since piracy and counterfeiting can be more easily identified by customs officials. Although this fact was recognised internationally, it was only with the adoption, in 1994, of the World Trade Organization (WTO) Agreement on Trade Related Aspects of Intellectual Property Rights (TRIPs) that specific international obligations were assumed by States as to the intervention of national customs authorities in this field. More specifically, Section 4 (Special requirements related to border measures) of Part III (Enforcement of Intellectual Property Rights) of the TRIPs Agreement has been implemented into EU legislation by Regulation No 1383/2003. Regulation No 1383/2003 concerns customs actions as regards to goods suspected of infringing certain IPRs and the measures to be taken against goods found to have infringed such rights. Together with its implementing Regulation 1891/2004 it sets the conditions under which Member States’ customs authorities may intervene in cases where goods are suspected of infringing IPRs and the steps to be taken when goods are found to be illegal. 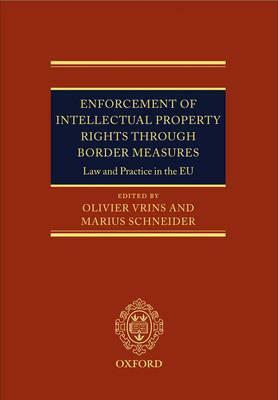 The EU regulatory framework for the enforcement of border measures, and its application through national rules and procedures of the Member States is the subject-matter of Enforcement of Intellectual Property Rights Through Border Measures – Law and Practice in the EU, edited by Olivier Vrins and Marius Schneider, now in its second edition. The need for a book that analyses an EU regulation and its application in the Member States lies, as explained by the editors in the preface to the book, in the complex relationship between Regulation No 1383/2003 and the national laws of the Members States. Indeed, some provisions, such as Article 17 and 18 seem to require measures which could be assimilated to implementation measures. Furthermore, “several of the articles of Regulation 1383/2003, insofar as they refer to substantive non-harmonized rights (defined by national law), render the Regulation a variable-geometry instrument” (p. vii). The book, which can easily be considered as the leading text in this field with regards to EU law, is divided into five parts which are preceded by very detailed tables of legislation and national case-law. The contributors are leading practitioners in their jurisdictions, officials in international organisations and renowned academics. Part I sets the stage for the analysis: Chapter 1 examines the phenomenon of piracy and counterfeiting and its economic and social consequences; Chapter 2 deals with the involvement of organised crime in IP rights’ infringements. Part II contains only one Chapter that describes the origins of the international framework (namely the Bern and Paris Conventions and the TRIPs Agreement) and relevant provisions of the TRIPs Agreement as well as post-TRIPs developments, such as the Anti-Counterfeiting Trade Agreement (ACTA). Part III contains two Chapters and is dedicated to the EU legal framework. Chapter 4 offers an overview of the EU policy and competences with regards to the enforcement of IP rights. Chapter 5, written by the editors of the book, provides a detailed (168 pages) analysis of Regulation No 1383/2003. Since the first edition (in 2006) of the book, Vrins and Schneider have, of course, updated the text in the light of some key decisions rendered by the EU Court of Justice, such as in Nokia v HMRC (case C-495/09). Part IV, from Chapter 6 to Chapter 32, is the core part of the book, with 800 pages of text providing a detailed overview of the customs practices of each of the EU Member States, including Bulgaria and Romania. Croatia, which only joined the EU, very recently, on 1 July 2013, is therefore not mentioned. The national chapters adopt the same structure, which allows readers to easily find the national solution for identical problems. The extremely practical approach followed makes these chapters very useful to practitioners and all those involved with such issues. Part V contains a final chapter, by Jeremy Phillips, providing a conclusion to this impressive work. Having said this, Regulation No 1383/2003 has recently been repealed by Regulation No 608/2013, adopted on 12 June 2013 (published in the Official Journal of the European Union L 181 of 29 June 2013). This new regulation is aimed at improving the effectiveness of customs controls so as to prevent illegal or dangerous products from entering the EU. Whilst this is not the place to comment or analyse the new regulation, it can be briefly noted that the new rules, allow customs officials to work faster and more effectively. They include a simplified procedure to allow the destruction of goods without a court order, provided that the copyright holder agrees and the importer does not object. In the light of the new regulation, one might ask is the book under review still to be recommended? The answer is definitely in the affirmative. The new rules will apply, with some minor exceptions, only from 1 January 2014. The “old” regulation will still constitute the legal basis and framework applicable for facts and situations that emerged under its life. Finally, it is a mine of information and analysis that will also be relevant under the new legislation. In conclusion, the book under review is a must-have for those involved in this field and will prove an essential tool in the coming years when the new legislation will be fully applicable.